Before the first shots were fired at Gettysburg - for many, the most significant engagement of the American Civil War - a private battle had been raging for weeks. As the Confederate Army marched into Union territory, the Federal Forces desperately sought to hunt them down before they struck at any of the great cities of the North. Whoever could secure accurate information on their opponent would have a decisive advantage once the fighting started. When the two armies finally met on the morning of 1 July 1863 their understanding of the prevailing situation could not have been more different. While the Rebel Third Corps was expecting to brush away a group of local militia guarding the town, the Federal I Corps was preparing itself for a major battle. For three brutal days, the Rebel Army smashed at the Union troops, without success. The illustrious Confederate General Robert E. Lee would lose a third of his army and the tide of the rebellion would begin its retreat. Robert Lee himself would begin the argument on the contribution of military intelligence to his defeat by seeking to blame his cavalry. Generations of historians would debate into what factors played a decisive role, but no one has sought to explore the root of how the most able General of his era could have left himself so vulnerable at the climax of such a vital operation. 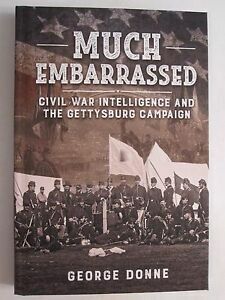 Much Embarrassed investigates how the Confederate and Union military intelligence systems had been sculpted by the preceding events of the war and how this led to the final outcome of the Gettysburg Campaign. While the success of the Confederate strategy nurtured a fundamental flaw in their appreciation of intelligence, recurrent defeat led the Federal Army to develop one of the most advanced intelligence structures in history. Lee was right to highlight the importance of military intelligence to his failure at Gettysburg, but he would never appreciate that the seeds of his defeat had been sown long before. ...lucid analysis of Union and Confederate intelligence gathering functions and services provided the respective commanders...For all students of Gettysburg, Much Embarrassed is a must read for its incisive rendition of the battle of wits which occurred between Union and Confederate commanders... this study enhances our knowledge of the critical but oft neglected intelligence operations aspect of the Gettysburg Campaign.